Local San Francisco manufacturer, Waterfield Designs, announces the Bolt Briefcase designed with functionality and style for modern techies and business travelers. Carefully designed organizational features and a look that shifts easily from casual to professional work environments make the Bolt the ideal bag for today's interconnected, mobile professional. When designing the Bolt, we started with a list of what we travel with and how much protection and accessibility we need for each item. WaterField Designs announces an attaché designed to meet the evolving needs of tech professionals and business travelers—the Bolt Briefcase. Techies and travelers carry a range of gadgets in diverse sizes, each of which require varying degrees of accessibility and protection; the Bolt’s thoughtful design addresses these diverse needs. Its classic lines and materials age beautifully and shift easily from professional to casual settings. 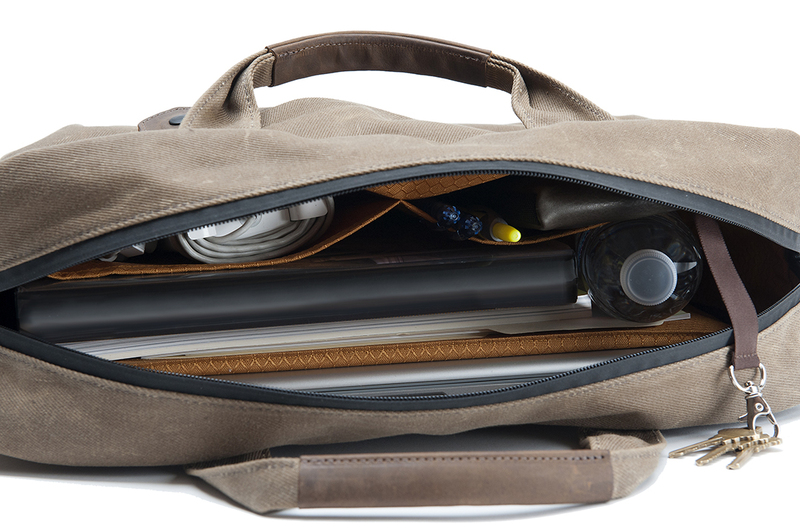 The Bolt is the ideal bag for today’s interconnected, mobile professional. The Bolt’s organizational scheme is a traveling professionals’ closest friend. 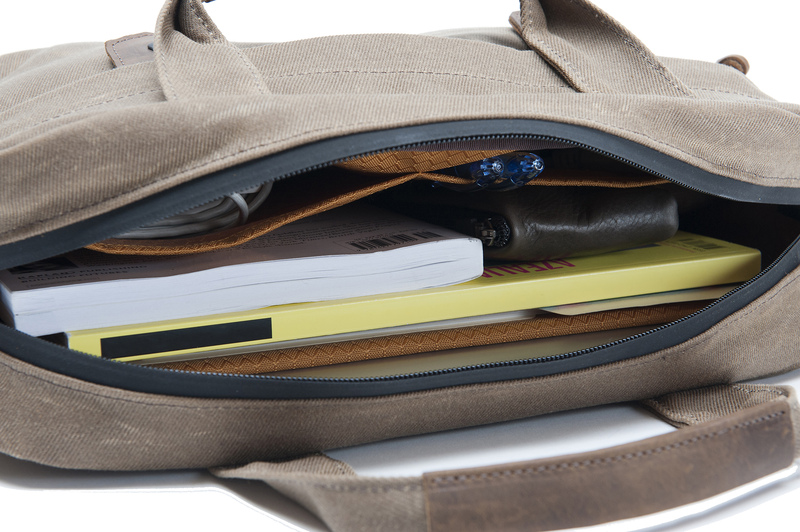 Two easy-access pockets hold frequently-needed items like wallet and phone and stay closed with invisible magnets. Above that, a hidden, horizontal pocket secures with a waterproof zipper to hold intermediate-access items like tablets and boarding passes. The spacious main compartment includes a padded laptop slot to keep this key item well-protected; two additional open-topped pockets to organize pens, business cards and other miscellany; and a key fob for quickly retrieving these necessities. A rear slot slips onto a rolling suitcase handle. 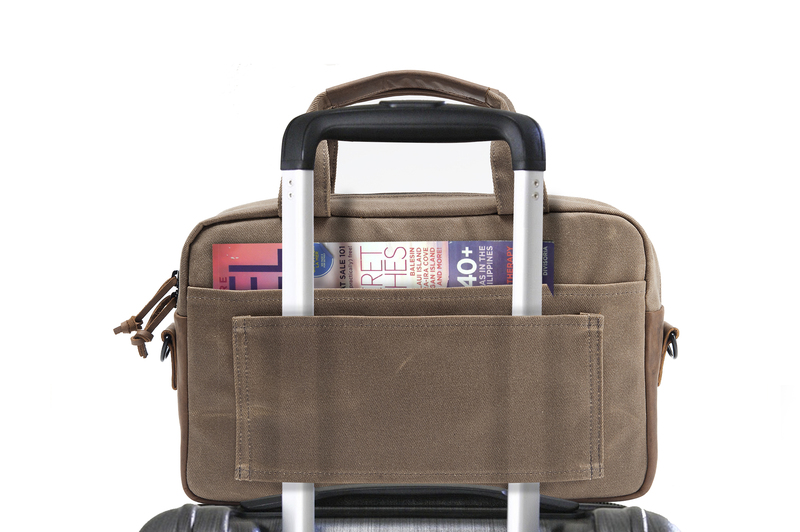 The Bolt Briefcase can be configured to fit just about any environment. From the most professional Blue Chip conference room to a more casual start-up office to a weekend with friends, a choice of rugged black ballistic nylon or durable tan waxed canvas and a choice of black, chocolate or grizzly naturally-tanned, full-grain leather accents let users customize the look to individual needs. For professional settings, the dual leather-lined handles are the best carrying approach. For dashing through airports, however, the Bolt’s thoughtful details deliver more practical conveniences—either the detachable, suspension shoulder strap or the wide slip that fits over rolling suitcase handles is the way to go. 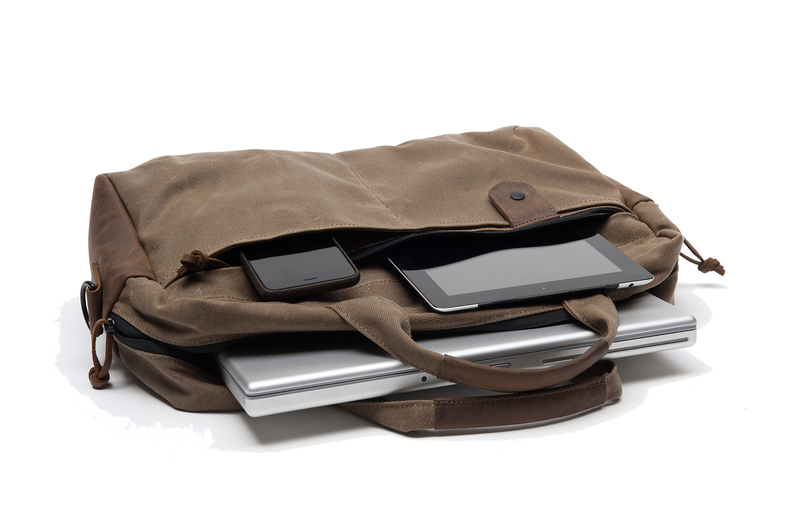 The Bolt is available in two sizes to fit up to 13-inch laptops and up to 17-inch laptops plus accessories. 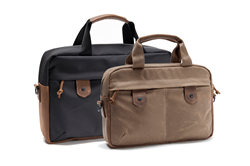 The smaller of the two is ideal for day trips, while the larger can fit shoes and overnight accessories when necessary. Small: $249. Dimensions: 14.5" x 10.5" x 4”. Weight: 1.95 lbs. Large: $279. Dimensions: 17" x 11.5" x 5". Weight: 2.95 lbs. 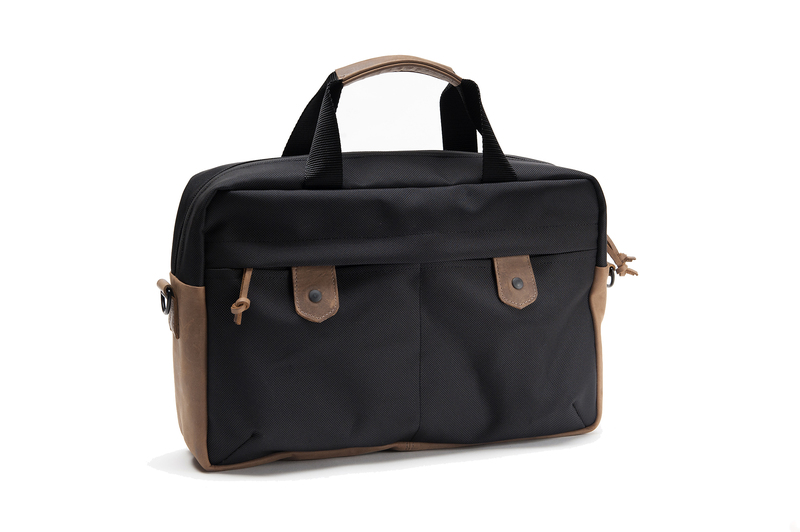 Color/Materials: Black ballistic nylon or tan waxed cotton canvas base. Accents and trim in full-grain, vegetable-tanned, black, chocolate or grizzly leather. 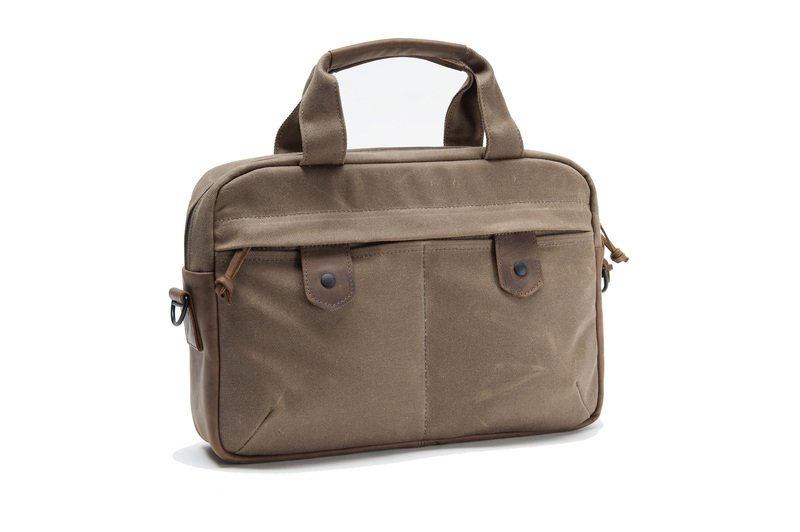 Bag includes two handles and a detachable shoulder strap with a removable shoulder pad. The Bolt is made to order within five business days of order placement. Shipping begins 1/20/15.